Toys are, by definition, objects of play. In the hands of photographer David Levinthal, however, these objects of play play with our objectivity. He turns the innocence of toys upside down, using tiny figurines to create lurid scenes, some of which are vaguely menacing, some of which are painfully touching, some of which are horrific, some of which are deeply disturbing. 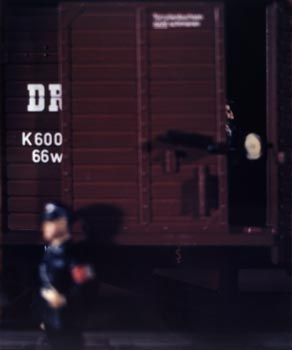 The fact that he uses toys to do this is makes Levinthal’s photographs both absurd and strangely absorbing. I mean, come on…toys? Levinthal was born in 1949; he’s an adult. What’s he doing playing with toy figurines at his age? And calling the photographs Art? Selling his prints for thousands of dollars? Just what the hell is going on here? It all began in 1966 when Levinthal was 17 years old. He borrowed his father’s Nikon in order to take a photography workshop. Inspired by the pretty photographs he’d seen in magazines, he woke up early one morning and drove to the coast to take a picture of the sun rising over the ocean. Levinthal, however, lived in California. Apparently, it never occurred to him that the sun doesn’t rise over the ocean on the west coast. Unsure what to do, he shot several photographs of the wet sand in the pale morning light. His teacher and classmates assumed the light was moonlight, and were very impressed. The lesson for Levinthal was this: photographs can create their own reality. In 1971 the ugly finale of the Vietnam war was being played out on television. 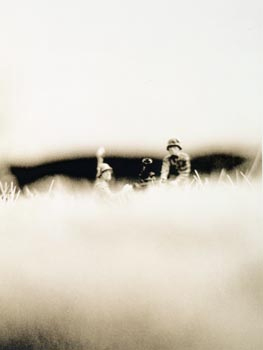 Levinthal was a student of photography at Yale’s Department of Design. He and another student (Garry Trudeau…later to become the creator of Doonesbury) began to create war vignettes using toy figurines. They didn’t use the ongoing war in Southeast Asia, but the war of their parents generation…the Nazi army’s invasion of the Soviet Union. Those early photographs grew in complexity and eventually became Levinthal’s first book: Hitler Moves East. 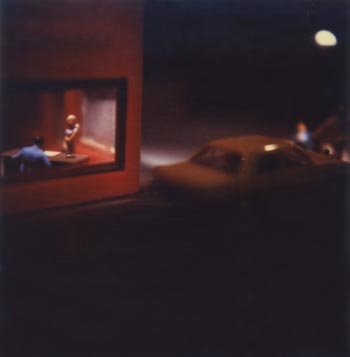 And therein lies the heart of the conundrum of David Levinthal’s work. Does the use of toy figurines diminish the seriousness of the subject? Or does the impersonal nature of mass-produced figurines say something about the impersonal nature of the experience being photographed? The Soviet leader Stalin once said “One death is a tragedy; a million deaths is a statistic.” Mass-produced figures, mass-produced war, mass-produced casualties. Is Levinthal making that comparison here? When thousands…tens of thousands…share the same experience, the face of the individual can become blurred. That applies not only to war, but to all universal experiences. Like loneliness and heartbreak and the desperate yearning for some connection with other people. In the mid-1980s Levinthal released a new series of photographs entitled Modern Romance. These are Hopper-esque, noir-inspired images. Each of them carries an edgy sense of waiting…though we’re not ever quite sure what the characters are waiting for. Romance, maybe. Surcease of pain, certainly. But there are many ways to end the suffering of daily life, and Levinthal leaves it to the viewer to decide what’s going to happen. Levinthal turned his eye to other cultural phenomena: the Wild West, bathing beauties, fetishism…all recreated with toy figurines. But his next real success took place in the early 1990s when he returned to World War II. This time, the Holocaust. Levinthal’s series Mein Kampf may have been inspired by Art Spiegelman’s graphic novel Maus, which also used an informal medium to examine the horrors of genocide. Many critics suggested that the only way to bring the horror back to an audience that was becoming increasingly immune to depictions of the Holocaust was to reframe it. The use of media originally intended for children…comic books and toy figurines…could unsettle an audience accustomed to seeing images of genocide. 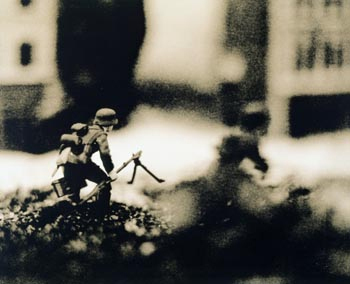 Levinthal has continued to create work that offended many, inspired some, and earned him a reputation for controversy. He photographed racist cultural artifacts (lawn jockeys, “Mammy” cookie jars, Little Black Sambo figures), Barbie dolls, shunga netsuke (sexualize Japanese miniatures), Jesus. But though some of his series have generated controversy, none of his recent work has achieved the same critical acclaim as his early studies of figurines. Is it art? Is it good art? Is it meaningful art? I’m not sure it matters. I admire the audacity of using small scale figures to explore large scale events, of using toys to examine topics that are not amusing, of turning the trivial to the service of the serious. While his work is too self-consciously tuned to irony to be truly ironic, it does serve to bring important topics into the public forum.